"It ain't over till it's over," is a one of the many quotes by Yogi Berra, and it applies to the gift Sigma Pi Fraternity gave to Vincennes University for our 100th anniversary. 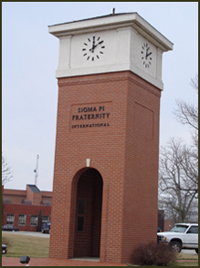 Although the Centennial Clock Tower was dedicated on September 6, 2000, there are still 300 bricks available. This means YOU still have the opportunity to become a part of history by purchasing a commemorative brick engraved with your personal inscription which will be a record of your part in Sigma Pi history! On January 26, 1897, Miss Charlotte N. Malotte, the professor of Latin and French, spoke to a student group at the chapel hour. She spoke on the subject of College Fraternities which sparked the interest of several students. Then, on the afternoon of February 26, a new fraternity had its first meeting. When, after a long session, the meeting adjourned, a literary society had been born, though it was yet unnamed. That, Mrs. Bayard said, would make an excellent motto for your organization. With this remark she left the room, and her suggestion had accomplished its purpose. A motto had been found. It would be appropriate to say Tau Phi Delta was hardly a fraternity chapter, as that term is now understood. Rather, it was a combination of the fraternity idea and the old style literary society, the like of which flourished in almost every college in the United States in the 19th century. However, in all its outward aspects, Tau Phi Delta possessed the characteristics of a fraternity chapter. It was strictly secret and possessed a password and a grip and included an initiation ritual. 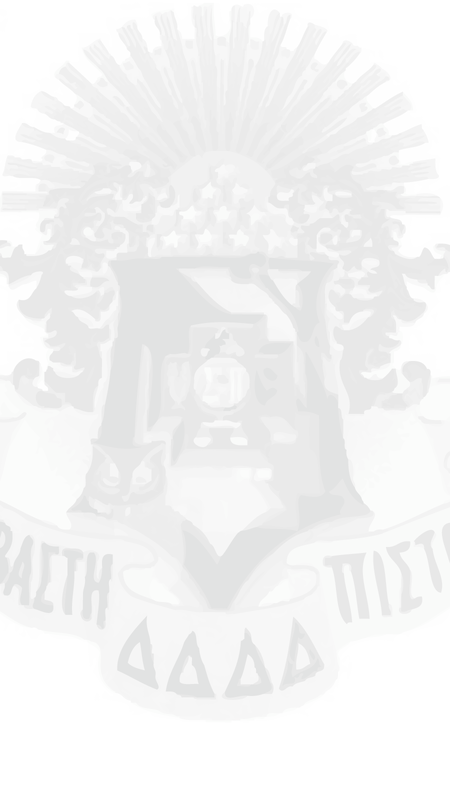 Its badge was a simple black shield, with a border of gold, upon which were displayed the Greek letters TFD. The colors were black and gold, and the red clover was the official flower. In 1984, the Fraternity again changed its name. At the 37th Biennial Convocation, Sigma Pi became an international fraternity by accepting its first Canadian chapter. This international status required the Fraternity to become Sigma Pi Fraternity, International. Today, Sigma Pi is comprised of 118 active chapters, 15 colonies, over 86,000 alumni. The history of the Delta Zeta Chapter started with a local fraternity founded at Meramac Community College in September 1964. Donald Occhi and Glen Pauli founded Sigma Kappa Phi (Crest on Right) for the express purpose of expansion. Under the leadership of president Michael Summers, the young fraternity expanded to the University of Missouri St. Louis (Beta Chapter), Forest Park Community College (Gamma Chapter), and Florissant Valley Junior College (Delta Chapter). In 1966, the fraternity was chartered by the State of Missouri as Sigma Kappa Phi Alpha Fraternity. The Beta Chapter of Sigma Kappa Phi, founded in October of 1965, became a strong organization in itself. In 1966, the Ballwin Party Palace at #35 Castlewood Drive off of New Ballwin Road was purchased for $2500 and became the Beta Chapter house. Despite the purchase of a house and a rapidly growing membership, there were going to be great troubles ahead. Sigma Kappa Phi was the only local fraternity at UMSL and there was little hope of surviving against the strong national organizations. So, the search was on to find a national fraternity to affiliate with. Fred Bondurant (AP) approached the men of Sigma Kappa Phi about Sigma Pi. On February 25, 1968, the Beta Chapter of Sigma Kappa Phi Alpha ceased to exist and the University of Missouri – St. Louis Colony of Sigma Pi Fraternity of the United States was born. In December 1968, the Colony petitioned the Grand Council for Sigma Pi for their Charter and on April 12, 1969, they became the 101st Chartered Chapter of Sigma Pi Fraternity of the United States with 27 colony members initiated as Charter Members. Past President Gene Grindler became the Chapters first Alumnus. In October 1978, the Ballwin Party Palace burnt down. The House at 8645 Natural Bridge Road was purchased in February 1979 for $40,000 on a 15-year note and was paid off in 1993. The House at 8645 served us well! In September 2012, a new chapter began at UMSL, life at the new chapter house began. Our new address is right across from the University at 8224 Natural Bridge Road.